CrewBloom, a US-based outsourcing company, had connected world-class Filipino professionals to different business and entrepreneurs to work for them. They noticed that applicants who desire to work home-based are clueless on where to start looking. Most of job seekers simply search "home-based job" or "remote job" and click page per page, which could be tedious work to do. 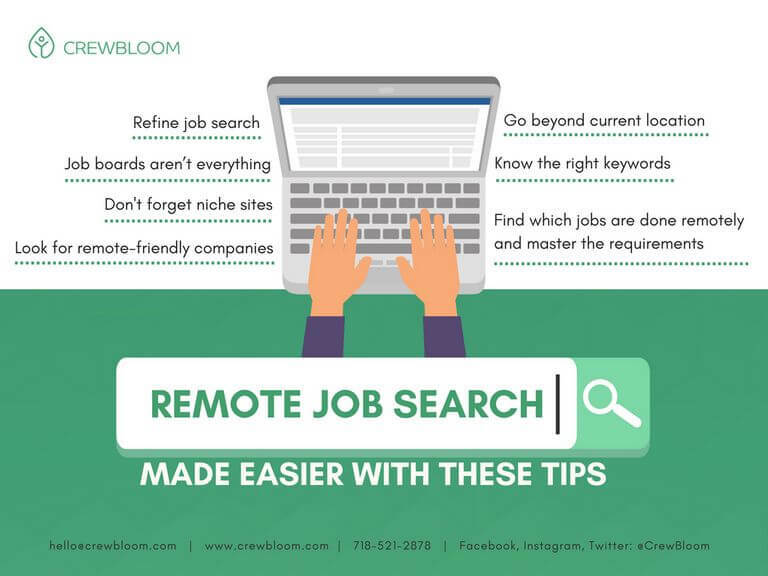 To save energy of job-seekers, CrewBloom prepared some tips and tricks to level up your remote job hunting skills. Rather than looking through job board or Google’s search results, focus on websites that specialize in remote jobs. They have a filtered reliable search engine dedicated for remote jobs. These websites will help job seekers stray away from scam jobs in the internet. Flexjobs, We Work Remotely and Remote.co are some trusted hubs to check. Nowadays, social media is a powerful means of communication. It could also be a source for a job opportunity. Majority of business post their new opening in their social media sites like Facebook, Twitter and LinkedIn, so keeping track and being updated will help you find your perfect job opportunity. Also, most companies allocate “Careers” or “Jobs” section on their websites for job seekers to explore. Knowing your desired industry to work on will narrow your search. Niche sites come handy in these situations because they are categorized in different industries. Angel.co (tech startups), GitHub Jobs (web development), MediaBistro (media or advertising), GoodFood Jobs (food industry), and Idealist (non-profit sector) are few niche sites to choose from. Job titles and description may vary from employer to employer, so job seekers must know the commonly used words. To make sure to get all possible remote job opportunities, use terms like “remote,” “home based,” “work from home,” “virtual,” “online jobs” ,“telecommute” or other synonymous words. Keywords are also applicable to job titles, so take your time to know these words. Remote jobs are not bound by location. It is necessary to remove the location criteria when searching for remote jobs for vast and broader job opportunities. As the days go by, the remote jobs model is expanding. Customer support, multimedia and information technology jobs are more common in these fields. Content writing is another remote job that is in demand these days. As a job seeker, it is important to know the skills necessary for these jobs. It is also advisable to put technical skills in your online resume to make it easy for employers to find you. Remote-friendly companies cater office-less jobs wherein all jobs are done remotely. Using the keywords “completely distributed” or “100% distributed” will help you keep track of these jobs.